The Music Education Hub led by Kent Music has a range of responsibilities in line with the National Plan for Music Education published in November 2011 by the Department for Education. Music Education Hubs receive a grant from the Department for Education (DfE) which is administered by Arts Council England. In turn, some of this funding is distributed directly to schools so that music education opportunities, as listed in our funding terms and conditions, can take place. This funding is intended for use in state schools only. In order for state schools to qualify for this funding, a complete submission of our annual survey is required. The survey is released in the spring of each year. non completion of this survey will result in funding not being administered or withheld. The Annual Survey for the academic year 2018/19 will go out to schools on the 20 May 2019 for submission of information about music in schools covering this academic year. This survey needs to be submitted by 21 June 2019 in order for funding to either commence or continue. all schools will receive an email containing a link to the survey. it can only be completed and submitted online. When available a reference PDF copy of the survey will be found here. Please do not submit this copy as your survey return – you can only complete and submit online via your personal link. In the financial year 2017/18 we reviewed the funding that we allocate to schools in the light of a growing Kent schools population. From the 1 April 2018 we changed the way that the schools funding allocation is calculated. Since the start of the music education hub in 2012, many schools have grown and there was pressure on our budget to the point where in 2017 we had to review the funding levels. The amounts of funding we receive from the Department for Education will not increase between now and the end of our current funding agreement on 31 March 2020. 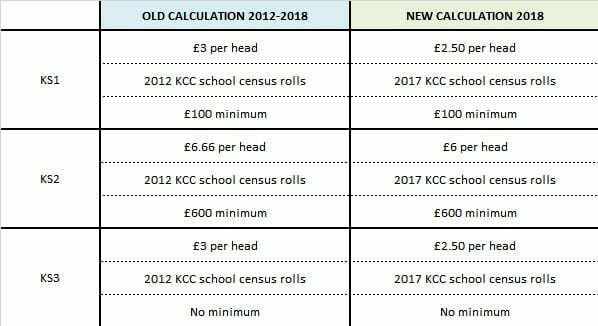 In light of this, we reduced the amount of funding per head but used updated census figures (KCC spring 2017) to allow for school growth to that point. For many schools there was little or no change as we maintain the minimum payment levels. Funding is a contribution towards the cost of a KS1 music curriculum. It is calculated at £2.50 per KS1 pupil (based on 2017 KCC census figures) with a minimum of £100 per school. Funding for Key Stage 1 is paid directly to schools providing KS1 music teaching on the 20th of each month between May and March with a double payment in May. All funding should be used with a long term investment in mind and NOT to pay for one-off events. Funding is a contribution towards the cost of one KS2 year group receiving up to an academic year of Whole Class music teaching. This funded whole class offer is called MusicPlus. It is calculated at £6.00 per KS2 pupil (based on 2017 census figures) with a minimum of £600 per school (£500 minimum for SEND schools). If you provide a MusicPlus offer in one year group in your school and you have completed the annual survey, you will receive funding. This MusicPlus, as it is funded is subject to the Kent Music Quality Assurance process. To an accredited agency ie: Kent Music. If you choose a Kent Music teacher you will not receive this funding directly. Funding is a contribution towards the cost of music education in secondary schools. Our terms and conditions state what this funding should be used for. It is calculated at £2.50 per KS3/4 pupil (based on 2017 census figures). Funding for Key Stage 3/4 is paid directly to secondary schools on the 20th of each month between May and March with a double payment in May. Kent Music should be notified of any changes to bank account details so that funding can continue unhindered.